October 25, 2008 September 30, 2009 laurakschroeder4 Comments on Whats up in the 313??? Whats up in the 313??? BU PRSSA does Nationals in Detroit, MI!!! 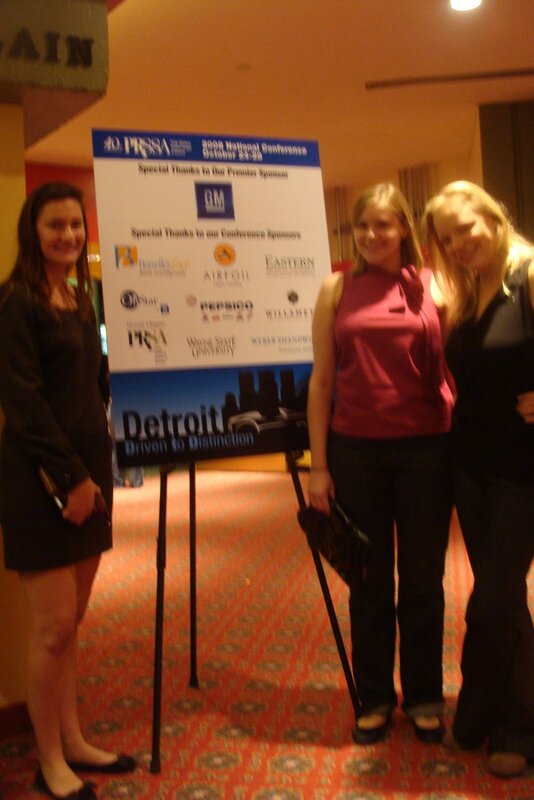 Friday was the first day of events for the 2008 PRSSA National Conference. We found ourselves meeting a ton of Chapters from all over the country! BU PRSSA is making a big statement with our plans for PR Advanced and PRSSAgency – internshipratings.com and pleasedressme.com – you are already being plugged in so great ready for some new hits! The sessions today showed Chelsea, Heather and I some great ideas on Chapter Development, Office Policies, Pitching Secrets for Clients and much more! We are so excited to bring back all the information we are getting!! Here are a few pictures to see what we have been up to! Keep you posted! The 313 is Detroit’s area code. We stole the post title from PRSSA. Clever, huh? Yay! You guys are blogging! Keep it comin’! Woot woot!